A few weeks back I asked H if he would like to attend the ASAN Vancouver Disability Day of Mourning Vigil with me on March 1st, at the Woodlands Memorial Gardens in New Westminster, BC. Over the last few weeks I have been thinking back to when H visited The Woodlands Memorial Gardens, in the spring of 2012 with my mother and me. Woodlands, constructed in 1878 and finally closed in 1996, was an institution, an ‘asylum for those with developmental disabilities and the mentally ill’ and then later a residential school. It was a place of incarceration, exclusion, dehumanization, and the existence of this institution and the attitudes that went with it, denied those with developmental disabilities the right to be valued for who they were and to included in their families and communities. “This past Sunday, my Mom, H, and I walked through the memorial gardens there. We read the signs – telling about the injustices and atrocities that occurred. A touch of spring accompanied us briefly on our deeply moving trek. The sun came out and stole away a bit of the chill, and the early buds promised something more of the spring yet to come. Today was just a glimpse. I glimpsed another thing emerging today as well… H’s understanding of injustice. As we read the memorial plaques – H became increasingly interested and was full of questions. Who lived here? Who? When? Did they put people with autism here?? You mean I might have been in a place like that?!? Well – families were often told that they shouldn’t raise their children. Lots of people – and even doctors would say that. 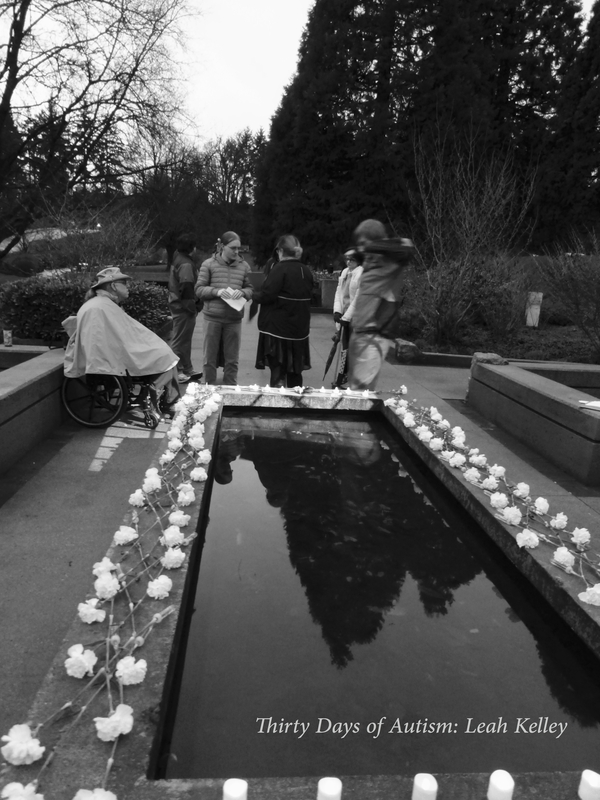 We looked at the images created by Corbett O’Toole for “LISTENING TO GHOSTS: Making Art about Disabled People Killed by their Families” – and I read him the post from last year, with the words of Norman Kunc and Emma Van der Klift – and we listened to this speech from the ASAN Vancouver 2015 Vigil by Amythest Schaber. H is deeply, deeply empathetic. He feels things soooo intensely, but he knows I will be there – and we have planned for dinner with our good friends Norm and Emma afterwards. I think he is old enough to build his understanding of why I spend my time, along with so many others, doing this activism stuff… and to know that there is a place for him at the table… if/or when he wants to add his voice. H may or may not be an activist like his mom, but he will understand why I do what I do – and that he has a right to rail against negative stigma – and not be beaten down by it. I do not want my son to accept the shame foisted upon disabled people. It is my job as a parent to support him so that he is proud of his authentic self, and that he understands and embraces that disability is a part of this. And then I realize… of course H is not ready. I know H will be surrounded by a community of people who care about him and who have the skills to help him process and keep him safe. I would rather plan to share this with him in a well-thought-out way than have him stumble across such horrific information without the scaffolding of love and support. 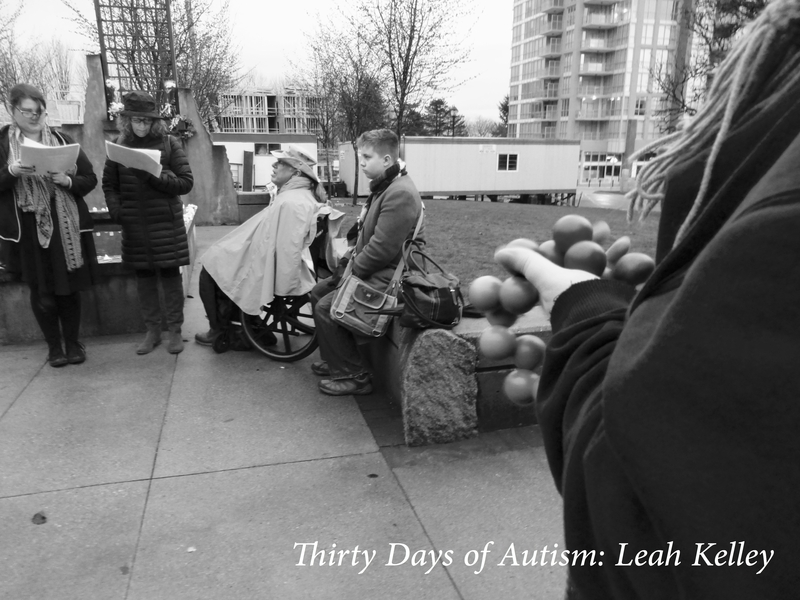 Black and white photo of Emma and Alanna reading aloud the names of disabled people who have been murdered. Norm and Harrison are listening. The arm of another mourner is visible in the foreground, holding a stim toy. Image: Black and white photo of the reflecting pool surrounded by a lattice-work of white carnations. People who participated in the Day of Mourning are gathered around and talking after the vigil. 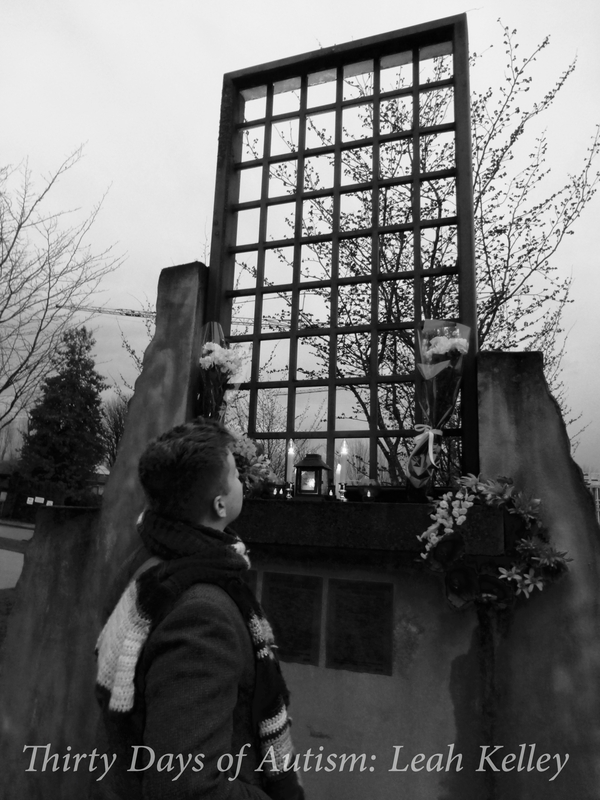 Image: Black and White photo of H looking up at and art installation represent cement walls with the barred windows of Woodlands Institution. This is has been recreated so that it is the same height as the windows would have been for the residents. There are candles and flowers arranged on the window’s ledge, and a tree can be seen through the bars. 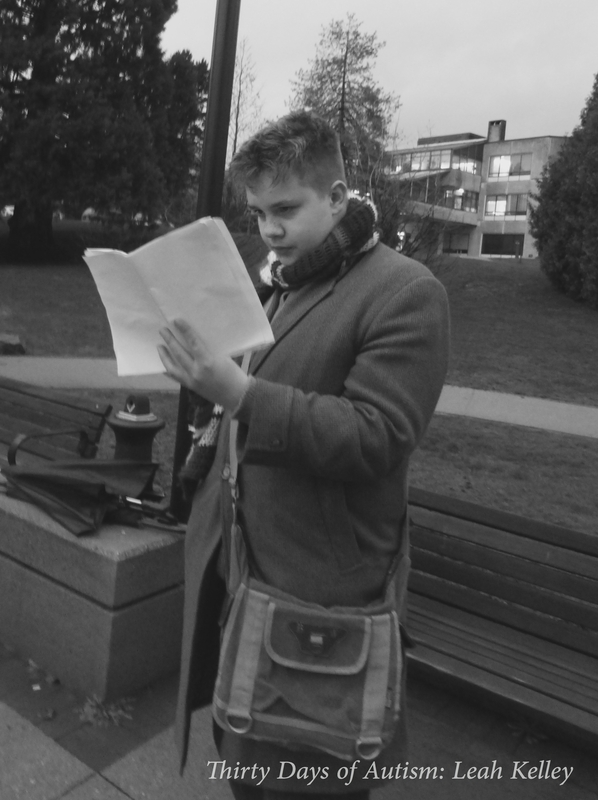 Image: Black and white photo of H (a white male teen with spiked hair, a retro woolen tweed trench coat, a Doctor Who scarf and a messenger bag) looking at the 10 page list of disabled people who killed by their families or caregivers. This entry was posted in ableism, Activist, Advocacy, ASAN, autism stigma, Autistic, Boycott Autism Speaks, Death, Disability, Grief, prejudice, Rail Against Stigma and tagged #DDoM2016, Activism, Alanna Rose Whitney, Amythest Schaber, ASAN Vancouver, Corbet O'Toole, Disability Day of Mourning, Emma Van der Klift, murder, Norman Kunc, The loss of innocence, Woodlands. Bookmark the permalink. It’s been awhile. B is doing alright – working to complete his adult grad. I just read your latest post and was wondering if you have heard the about the latest discussions by the committee working on Canada’s euthanasia law? Apparently the wording is being expanded to allow for those with disability and mental illness to choose doctor assured suicide. It scares me know that my depressed son would be able to choose this in a moment of extreme illness. I’m wondering if you are following this at all. We need to prevent this tragedy from ever happening again. 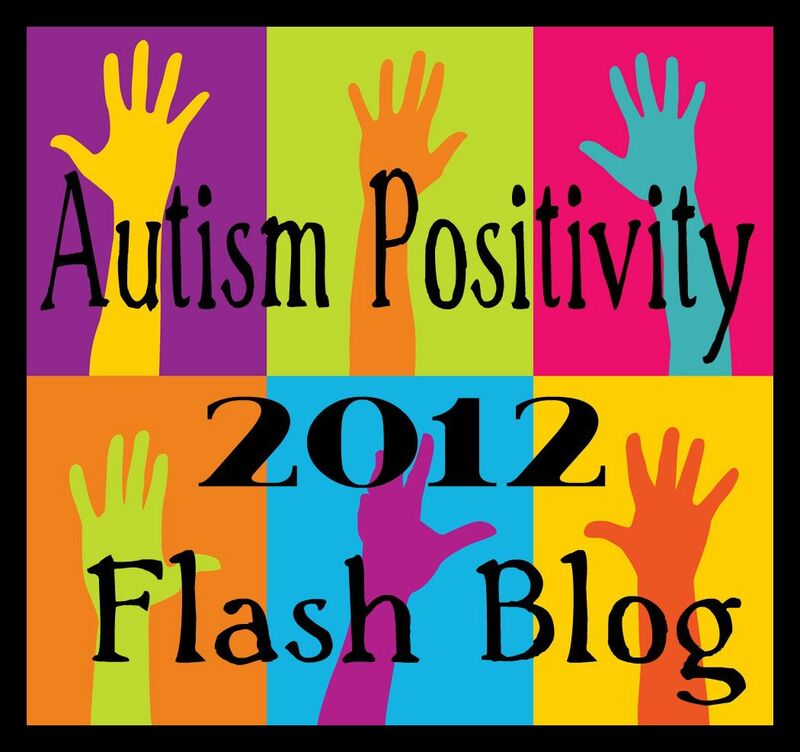 Thanks for all you do on behalf of those with autism and disability. It is lovely to hear from you. Thank you for the update and words of encouragement, and please say hi to B. And yes, I absolutely share the concerns your are expressing. It is a dangerously slippery slope. I will link up some resources here if you would like to find out more about what is happening and how other might get involved in advocating against changes that make people with disabilities even more vulnerable. We need your support to bring the Standard to the attention of Parliamentarians. The Vulnerable Persons Standard contains a series of safeguards that will help to ensure that Canadians requesting assistance from physicians to end their life can do so without jeopardizing the lives of vulnerable persons who may be subject to coercion and abuse. We are calling on all members of Parliament to ensure that federal legislation regulating physician-assisted death incorporate these safeguards. Wonderful Leah. Thank you for all you put into advocacy. (((William))) Thank you! It is so nice to hear from you and I appreciate your encouraging words! Thanks for this post. Do you have anything on Autism speaks condoning the killing of Autistic people? Their spread of ignorance and negative stigma in regards to Autistic people, with language that frames them as burdens and tragedy contributes to the perspective that these lives lack value. More specifically – in the video “Autism Every Day” (available on youtube) from Autism Speaks, a parent talks of considering killing herself and her autistic child in front of her child (around the 3 minute mark). HUGE trigger warning! This is a horrific video made by Autism Speaks and I am uncomfortable linking it up here…. Please keep telling the truth about Autism speaks. I am aware of that video. please share it with others and wake them up. Thanks for replying to my post.